I did this manicure a little while ago for my grandfather's 85th birthday party. Perhaps unsurprisingly my nails completely escaped his notice, but I'm really pleased with how this manicure turned out regardless! 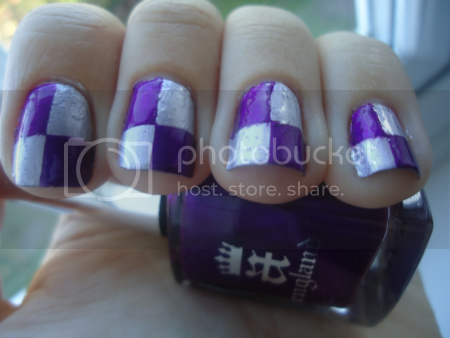 I began with two coats of China Glaze Devotion, which I have previously blogged about here. (In hindsight, I have no idea what possessed me to use this silver. It bubbles every time I wear it. Doh.) Once this had dried thoroughly I used Scotch tape to tape off three quarters of each nail. 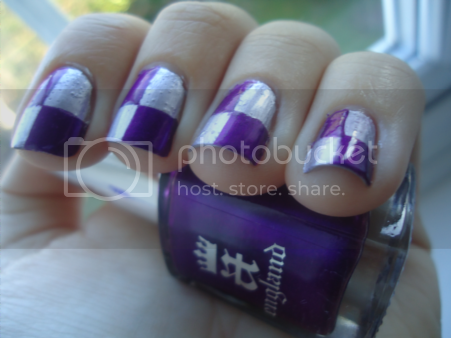 I painted this quarter with a-england's Avalon, the most amazing glowy purple. It's actually one of my favourite purples to wear. I only needed one coat to make it opaque. I waited for it to dry, then changed the tape so that it left the opposite quarter of each nail uncovered, and painted them with Avalon again. I then sealed it all with a top coat. Despite the bubbling on Devotion, I'm really pleased with how this turned out. I think the combination of purple and silver is so eye-catching.